Adam Blaine will lead the convocation procession with his bagpipes as a member of the Gates Keystone Club Police Pipes and Drums. Adam Blaine is hitting graduation on a high note. And perhaps some low notes, as well. 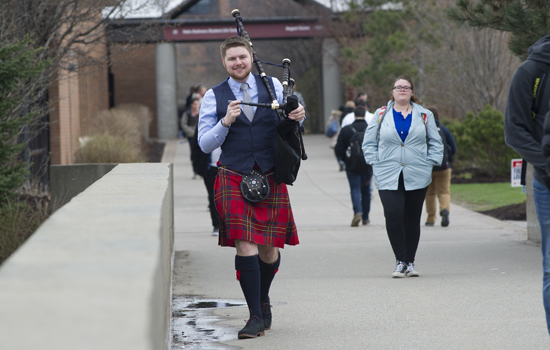 Blaine, who is graduating with a degree in software engineering, will lead the procession with his bagpipes as a member of the Gates Keystone Club Police Pipes and Drums. Then he’ll sing with Eight Beat Measure, an a cappella group that is also performing as part of the ceremony. Blaine recalls seeing the bagpipers when he was a new student. “He came up to us afterwards and said he was a bagpiper, and that was it,” said Lex Sleeman, RIT’s associate director of Intercollegiate Athletics/NCAA Compliance, and a member of the Gates Keystone Club. Since then, Blaine has marched with the group at their performances on campus each fall and spring. He also joined Eight Beat Measure and served as music director for the RIT Players for four years. Growing up in rural Peru, N.Y., he didn’t come from a musical family. But he played a lot of musical instruments as a child, including the piano when he was 5. The bagpipes came later. Blaine credits RIT’s co-op program and hackathons with helping him land a job with Apple – a job he accepted last September. He’s packing his pipes and moving to Silicon Valley, where he’ll work on their music applications team. “It’s my dream job,” Blaine said. And one where he can continue his music. While working two co-ops for Apple, he’s joined three different bagpipe groups in the community and has already started an a cappella group at Apple.